Emperor Saga (嵯峨天皇, Saga-tennō, 8 February 785-24 August 842) was the 52nd emperor of Japan, according to the traditional order of succession. Saga's reign started in 809 and ended in 823. Before he became the monarch, this prince's personal name (imina) was Kamino (神野). He was the son of Emperor Kammu, and he was the younger brother of Emperor Heizei by the same mother. He had nine Empresses and consorts; and 47 Imperial sons and daughters. Saga was known as a good writer. He sponsored the first imperial poetry competitions (naien). According to legend, he was the first Japanese emperor to drink tea. Before he became the monarch, he was Crown Prince for three years. 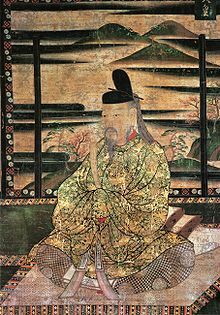 17 June 809 (Daidō 4, 1st day of the 4th month): In the 4th year of Emperor Heizei's reign, he was very sick and he abdicated. The succession (senso) was received by his younger brother Then the new emperor is said to have acceded to the throne (sokui). This was confirmed in ceremonies. 24 August 842 (Jōwa 9, 15th day of the 7th month): Saga died at the age of 57. According to the Imperial Household Agency, the mausoleum (misasagi) of Heizei is in Ukyō-ku, Kyoto. The emperor is traditionally venerated at a memorial Shinto shrine at this location. The years of Kammu's reign are identified by more than one era name (nengō). In ancient Japan, there were four noble clans, the Gempeitōkitsu (源平藤橘). One of these clans, the Minamoto clan are also known as Genji (源氏). The Saga Genji (嵯峨源氏) are said to be descended from Emperor Saga. ↑ 1.0 1.1 Imperial Household Agency (Kunaichō), 嵯峨天皇 (52); retrieved 2011-10-24. ↑ Titsingh, Isaac. (1834). Annales des empereurs du Japon, pp. 97-102; Brown, Delmer et al. (1979). Gukanshō, pp. 280-282; Varley, H. Paul. (1980). Jinnō Shōtōki, p. 151-163. ↑ 4.0 4.1 Titsingh, p. 97; Brown, p. 280. ↑ Brown, p. 282; Varley, p. 163. This page was last changed on 13 August 2018, at 17:25.